Some of your projects engage themes related to World War II and, by implication, the Nazi era, for example, Keimai 3 and Phlegethon-Milczenie. Your newest work, Sustenazo, also refers to that historical period, this time in connection with a specific place where you were part of the a-i-r laboratory program at the Centre for Contemporary Art (CCA) Ujazdowski Castle. Why are you interested in this particular theme? PJ: I am interested in what you said about the politics of gardening and the motif of cleansing the world. MW: Yes, in order to create a better one. The abrupt expulsion of the medical patients and staff from Ujazdowski Hospital by the German army is one example of such “cleansing.” Many other hospitals were forcibly evacuated in 1944. Such political gestures are absurd from the point of view of humanism. Sustenazo recalls an example of such historical absurdity, yet at the same time it is a poetic and abstract project. My work is built from multiple narratives in order to leave the meaning open to interpretation. 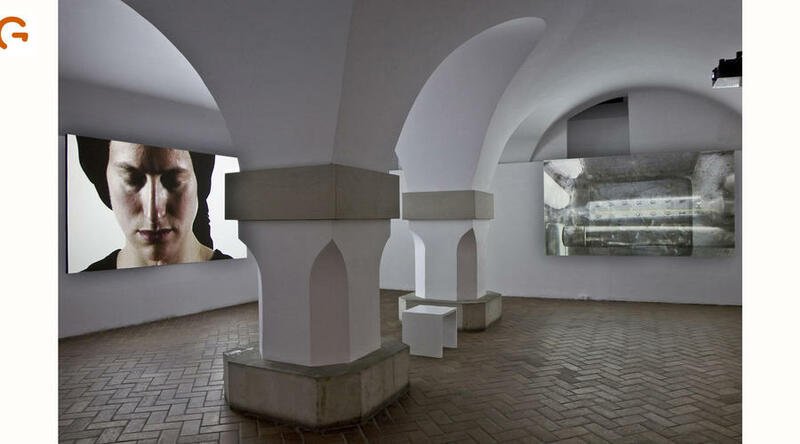 For instance, you mentioned the work Keimai 3, which was commissioned in 2008 by the Frauenmuseum in Bonn. This piece is similar to Sustenazo in the way it’s built from seemingly incompatible elements, such as documents, books, and maps from the 1930s (related to the Berlin Olympics), but also a Chinese sword, fencing equipment, and unusual drawings. Traces-lines drawn with charcoal appear on top of this material, connecting the archive into a single unit. Inspired by the medieval music of Hildegard von Bingen, I composed the soundtrack by overlapping different voices, layer upon layer, until they became an organic whole, almost a murmur. The viewer may remain on this abstract level or may go further into the political or historical theme, which refers to Helene Mayer, an Olympic champion in fencing and a German-Jewish athlete who represented Germany in 1936, even though her citizenship had been taken away from her the year before. Keimai 3 is therefore an example of a multi-thread composition. Sustenazo is not just a story of the forced hospital evacuation. PJ: Exactly. The exhibition’s press release states that you were inspired only in part by the history of this place. What else inspired you? MW: An important part of this work is the motif of lament as a form of expression outside language, confronted with the archive of a historical event—the expulsion of the hospital patients and staff. While working on Sustenazo I searched for other non-historical motifs that would be outside the boundaries of a specific place and time. The three video projections in Sustenazo represent three basic narratives. The first video refers to the historical event through the filmed archive of documents and objects. In the second video a woman slowly performs a dance of lamentation. In the third piece we see a young woman repeating a jump forward and backward (in Italian, a salto mortale, or deadly somersault), as if she was forever suspended in a space outside time, which may suggest the motif of absurdity. There are also two sound compositions: Lament I, which accompanies the video projections, and Lament II—a corridor of sound through which one must pass in order to reach the rest of the exhibition. There is also an installation of eighty-eight books, a dozen medical instruments, drawings, a map of Europe, and a photograph of Krystyna Janda’s bedroom. PJ: That photograph seems to be starkly different from the rest of the project, creating a kind of a dissonance. MW: In a way, the photograph is a reversed historical photograph. It is the memory of the place but seen now, today. It acquires meaning only in the context of the entire project, as the representation of the last site where the expelled hospital arrived. However, there is no information about where it is and why. I wanted to leave that question open. The photograph is in color, contemporary, cold, even though it’s a bedroom that displays clear signs of presence—crumpled sheets, a half-empty bottle with water by the bed. PJ: For me this photograph is a different element in the work, something surprising, as if from another poetics and, of course, I immediately wanted to know what it represents, what is that bedroom. MW: In Sustenazo various lines of narration intertwine as in a musical composition. Janda’s bedroom creates a dissonance, brings in another tone. Besides, the photograph was hung in the context of the drawings, which have a more archaic appearance. PJ: Do they come from your earlier projects? MW: No, these are all new drawings—the three larger works Nosze as well as 105 small drawings on pages torn from Goethe’s books; all are part of Sustenazo. Nosze (“Stretchers”) were inspired by a conversation with Krystyna Zalewska, who in 1944 was a thirteen-year-old nurse expelled with the rest of the hospital’s staff. During the several days of its exodus, the hospital had to make some stops. During one of them, Ms. Zalewska, together with another young nurse, was sent to the neighborhood to look for any wounded people. During their search they entered an abandoned building where they found a mountain of cabbage. Soon after that they were shot at, so they hid behind the cabbage, which they placed on the stretchers, and in this way managed to crawl back to the site where the hospital was temporarily located. Nosze were done on rice paper, which I placed on top of German stretchers from the 1940s, which I found in an auction. After laying down on them, I drew outlines around my body. I later transformed these outlines into the series of drawings. Furthermore, a single cabbage appears at some point in the video projection. Slowly unveiled layers of leaves are superimposed with pages from documents, which seem to burn, buried in sunlight. PJ: It seems that taking inspiration directly from the Ujazdowski Hospital’s history distinguishes Sustenazo from your earlier projects, since none of them referred so explicitly to the history of the actual site. MW: A few years earlier, Phlegethon-Milczenie in Potsdam (2005) already contained multiple layers of historical memory. It was my first work with authentic German books from before the war and with the notion of fire. Hence initially I was hovering around this subject matter in a general way: fire, German books. I included fragments of poems by Paul Celan, who wrote in the language that pained him, in the language of his own oppressor, altering, infiltrating this language. PJ: We are touching here upon the awareness of language, which is very important in your oeuvre. MW: Language is an independent system, which remains in relation to what it describes, but at the same time departs from the meaning, replacing it with the “purity of language.” In my recent projects, lament questions language. It is the moment of the collapse of language in face of the loss of the possibility to signify and to mean. PJ: In Sustenazo you refer to a specific event, however you don’t take into account other, also traumatic events from the castle’s history, such as its demolition in the 1950s by the decision of the Polish People’s Republic. Rather, you focus on a story from the time of the German occupation, concerning in fact many individuals. The evacuation of the hospital affected the lives of about eighteen hundred persons, so this project is also speaking of the trauma of particular people. MW: The archive of marginal experience is a story of life entangled in the game of power and authority by the accident of history. In my video, one cannot decipher the names of people participating in the exodus. I want to keep the privacy of actual people and their destinies. On the other hand, I respect their testimony, which one could call, after Agamben, an “enunciation.” The testimony of non-famous people, who bear witness to their own encounter with the powerful, creates a track of another history, of another ethos. PJ: Looking at your works from different series, sometimes one may have the impression that a given work recurs in several projects. Then you see that it is a completely different work, created for a specific project. MW: In Sustenazo two periods of work have come together and, to some extent, two residencies. Partially I began working on some of the elements of this exhibition a year earlier during my residency in Berlin. There I recorded average Germans, asking them to read aloud passages from Goethe. I incorporated a fraction of those recordings into my installation Expulsion in Berlin. However, these voices found their final home in Sustenazo. PJ: And you confronted these voices with the voices of evacuated Poles. MW: Mostly with one voice, that of the young nurse whom I mentioned earlier. In Sustenazo her voice covers other, German voices, especially that of one woman who reads Goethe in her crystal-clear voice, which is being distorted by the words spoken by the nurse. PJ: For most of your projects you also conduct extensive research? MW: Especially in this series I worked a little like an archivist and collaborated with archivists. I looked through and filmed all those documents. During my first residency at the CCA I worked with the Special Archives section of the Medical Library. During my second visit I filmed selected archives in the Museum of the Warsaw Rising that are mostly unavailable to the public. PJ: Did you include original documents in your project? MW: The documents in Sustenazo appear as visual references in the video. It is a very close, intimate view. My hands appear wearing medical gloves, showing that I am touching the documents, that there is an immediate contact. MW: Yes, with history. Hands wearing white gloves, which I had to wear while working with the archives, call to mind doctors’ hands. They bring to mind security, but at the same time danger. As a result of my CCA residency, I began collecting German medical books from before and during World War II as well as small medical instruments. Close-up views of those objects and also photos of anonymous bodies from the medical books appear in the video. A white-gloved hand smashes a chunk of charcoal, slowly covering a map of Europe with its powder as it draws, while the map gradually changes into a naked chest covered by medical drawings. I placed these open books and medical instruments on the ground, in the center of the installation, in a gallery below the level of the other galleries, so that you are looking at them from above. Alongside the medical books are also works of Goethe and Schiller published in the nineteenth century. They bear traces of ink and graphite. There are also scattered syringes, ampoules with surgical threads, a nurse’s bag. To get to that space one has to go through the sound corridor (Lament II) and through the rooms with video projections. The architecture of the castle’s cellars has inspired Sustenazo in a sense that the project is in a way a reversed journey of the hospital expelled out into the street; here you enter deep inside and under, returning, lower and lower, gradually sinking into the project. PJ: And how are the voices of the evacuated people, Poles, related to the voices of Germans, who are reading Goethe? What did you intend to achieve with such a juxtaposition? MW: As with the drawings made on pages from Goethe’s writings, the voices represent stains, traces that cannot be erased. Goethe’s voice can no longer exist without this other voice—the voice of the people who were damaged by the games played by the power elite. I arranged the voices so that they overlap each other. It’s an open space for someone who enters the project, for your feelings, thoughts. What’s interesting is that Germans receive this work in an entirely different way than, for instance, Poles; I am also wondering how this work will be received in New York, where it will be shown eventually. PJ: I think that, in the context of your works, it is important to have cultural awareness. If we don’t have it, then we can’t completely enter into those works, and so we may lose something in our reception of them. MW: I don’t completely agree, so I will speak through an example. There was a survey show at some point at the Lehman College Art Gallery (CUNY). The curator of the exhibition worried that because the gallery was located in the Bronx, the local population would have difficulty understanding the many layers of meaning in the works, and she wondered how to convey them to potential viewers. PJ: This is generally a question troubling the entire contemporary art world. MW: And yet, one day a group of local African-American women came and looked at all the projects. One of them came to me and said that for her it was about the breath of the world. Perhaps, then, there is a layer in my work that is more primary, primordial even. PJ: The titles of your works are always meaningful, and you often use Greek words, as for this project: Sustenazo in Greek means to lament, to whisper. MW: To lament together, to whisper inaudibly. PJ: The motif of lamentation appears in your video projection. MW: Yes, this is also connected to the archaic, the primordial. The oldest known forms of lament were practiced by organized groups of women, who usually took off their headscarves and let their hair down in a gesture of despair. PJ: Which in fact appears in one of the videos. MW: A woman very gradually takes off her headscarf. At a certain point the scarf returns to her head, tying her hair into a knot. The woman first bends down in one direction—perhaps she is falling, a little like a tree that bends in the wind. She returns, lifts her head up, and her hands move over her face, flowing. This repetition and mirroring of the movement also occur in the video of the acrobat who is forever jumping backward and forward. In ancient rituals of lament, for instance, in ancient Greece, women became one body, one memory, and one act of mourning. In many traditions, lamentation is a response to death on a massive scale, often from a war. Sustenazo suggests collective reaction, sorrow, and remembering. PJ: From what you say it seems like this is only women’s memory. But on the other hand there is also the masculine aspect—those who caused the evacuation were men. Man is the one who is the aggressor, who fights, who sets up borders, at least in cultural terms. In this way, gender seems to be an important topic. MW: Men—not just women—can participate in another reflective look at history. If we consider, for instance, that there is no gender (and if gender is difference), then I think such an anti-dualistic approach has more capacity to endanger so-called patriarchal forms of understanding, including understanding history, than the equality of the Other. Otherness seems problematic, because quite often it functions as a reason for massive crime. Hence I wouldn’t enclose this project inside so-called feminine sensibility. Taking responsibility, which the feminist Bracha Ettinger calls interconnectedness, now seems more crucial in terms of its revolutionary meaning for our culture than does equality—both sides having the same rights—which of course used to be, and in many regions of the world still is, necessary. MW: Postmemory refers not only to events that took place before our birth, but also to the break between a living being and a speaking being, which is a break that marks an empty place. Lamenting voices permeate this emptiness, spanning between memory, which remembers only what has been said, and forgetting, which is only that which was never said. In contemporary art there are at least two evident approaches to history. One is more drastic, immediate, usurping a right to enter someone else’s life without asking. I feel more affinity with another approach, perhaps like Balka or Boltanski whom you mentioned, which assumes sensitivity and respect toward the people taking part in a project. It opens up, invites, but also protects. There is a great difference between an exchange and a one-sided taking. PJ: I believe that, when an artist works with people who have suffered a traumatic event, it is important that after they have given something of themselves, they don’t feel as if something had been taken from them, as if something had been altered. Because a work is created and then has its own life, the artist moves on, produces other works, and the people who participated in the project remain themselves. MW: I always try to keep in touch with the people whom I engage in a project. For example, in Anamnesis I worked with women in Portugal. After a while I returned to show them the video that resulted from the project in which they took part. PJ: An important element in your works is the motif of the body. The experience of one’s body can be a journey to get to know oneself, can be a form of meditation. You show it in many of your earlier works, for instance, in Ennoia (2002), where you remained immersed in a chalice with water for many hours. In an interview you once said that the audience was leaving the museum, which was closing, and you were still in that chalice. At any rate, here you abstain from performance. As is characteristic for your work, in Sustenazo you combine different media—sound, drawing, installation, video—but there is no performance, and your body appears only through your gloved hands. Instead you employ the body of another person. MW: In Sustenazo another woman appears—my alter ego. The gesture of lamentation is performed by my extension, by this other yet not necessarily different person. Traces of the presence of my own body, my actions, occur in the touching of the books, documents, and medical instruments. These are my hands, but they are almost anonymous. There are also other traces-drawings, which involve a private form of touching. Perhaps on some level Sustenazo doesn’t depart much from my previous works, because this melting or merging into “others” or into matter (as into water, in Ennoia) works as “crossing out,” erasing one’s own presence. This is also articulated, for example, in my series of public-interactive projects, such as “Drawing Lethe” at the Winter Garden, in the World Financial Center, right near Ground Zero. PJ: In the case of the medical motif related to healing, which a hospital is supposed to provide, in this project there is a confrontation with the body and in general with human beings, who are perceived by the Nazis in an objectified way. MW: Perceiving the body as biological (biopolitics) creates a situation where a life has no value as such. Statistics make it possible to look at human existence as biological existence with political consequences, but this has nothing to do with empathy. This approach appears among others in Nazi policies and has its roots in European modernity, with its functional thinking on a grand scale. Bodies become meaningful only as connected to larger systems. Hence the body is a national body, an economic or geographic body. In my recent works the body is a continuously changing space. It is a membrane between “self” and the external “world,” a presence through trace. I try to show that presence in smallness, in that which is marginal, yet which is elevated into the realm of meaning through its encounter with history. 1] The house that is currently the home of Krystyna Janda in Milanowek near Warsaw was the last stop for many of the patients and doctors expelled from the Ujazdowski Hospital.